Well it looks like those dead leaves are now wet from the rain and are lying in the mud. Hooray! Warmer air has moved in and it's gross! This day is not the best for posting this recipe due to the warmth of the weather out. However, for those upcoming cold days when you just want to be comforted with the warmth of a creamy, hearty meal... This next recipe in the Cooking with TAY: Orange Food madness is just for you. Cooking with TAY: "Orange Food" Edition - The Appetizer Round! ...Presenting Chicken Paprikash with Dumplings! *We only had four whole legs that day, and we only used 2 onions this day. But we kept everything else the same because we're rebels. **As per the Swan, do not get low fat or non-fat sour cream for this recipe as that makes things everything taste too tart. Stick with regular for that required creaminess. Browning up a chicken in the mornin' mornin' may be just like shining it up. I'm not really sure on the semantics of it all. Add chicken broth (or bouillon) on low heat, simmer for 40 minutes or until tender. Remove chicken, stir in sour cream. Put chicken back in. Heat thoroughly but do not let come to boil. Sometimes I'm amazed I eat this with the vast number of onions required for this dish. The good thing is, they melt down. No sour cream in here yet. I'm just throwing pictures in to confuse you. In a 4 quart bowl, add 2 quarts of water, 2 tsp of salt and boil. While the water is boiling, take a teaspoon and scoop the dough, (about 1/4 of dough on the teaspoon at a time), drop dough in the boiling water until those cute, little dumplings float to top. Repeat this method until all dough is complete. 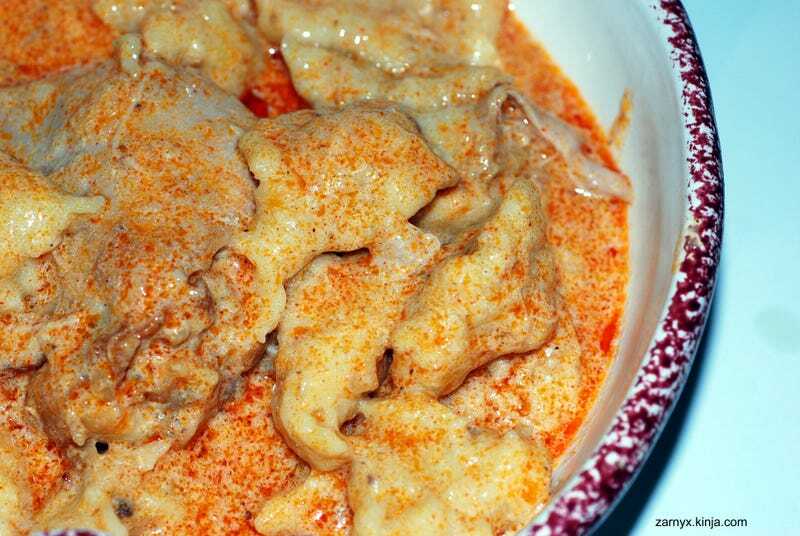 Then, add your dumplings to the Paprikash and serve. - On our next segment of "Cooking with TAY: "The Orange Edition", something something pumpkin something something cake.